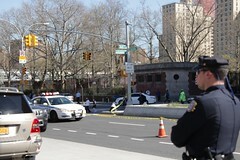 A man was struck by a Mercedes Benz around 1:46 p.m. today while crossing the street near the corner of Avenue C and East Houston Street, authorities said. The 43-year-old victim was taken to Bellevue Hospital, the police said. He is in critical condition, according to the fire department. No charges have been pressed in the matter.